It has been five years since John MacArthur wrote The Gospel According To Jesus. That book stirred the controversy over ‘‘Lordship Salvation’’ once again. The conflict has been primarily between MacArthur and Charles Ryrie of Dallas Seminary. Ryrie’s 1969 book, Balancing the Christian Life, contained a chapter titled, ‘‘Must Christ Be Lord to Be Savior.’’ In it he asked the question, ‘‘Must there be a commitment to Christ as Lord of one’s life in order to be saved?’’ He quotes Arthur Pink, J.I. Packer and John Stott in the affirmative. Ryrie takes exception. The question has most commonly been directed toward the attitude of a potential convert as he weighs the cost of discipleship. Is he ready to be saved if he is not ready to surrender every area of his life to Christ? Is he willing to make Christ Lord as well as Savior? Hence the term ‘‘Lordship’’ salvation. In his first book, MacArthur jumped in with both feet strongly on the side of Lordship. He spared no punches toward Ryrie and others in his defense of the Lordship position. This, no doubt, carved a deep gulf between these two otherwise compatible men. I even remember Ryrie coming to MacArthur’s defense over the ‘‘blood’’ controversy and MacArthur saying (in my hearing) ‘‘He ought to know, he wrote his own Bible.’’ But those days of comradeship are gone. For a while at least, this controversy is here to stay and to divide. 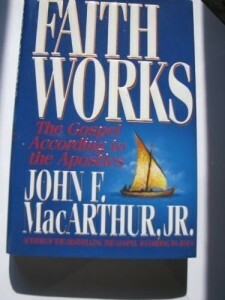 Many reviews have been done on MacArthur’s first book and many will be done on Faith Works. My observation is that the center of controversy shifted slightly but significantly from the first book to the second. In the first book, MacArthur emphasized the pre-conversion decision to make Christ Lord. I think this was his way at fighting back at easy-believism. Screen the new converts outside the door, not just inside the door. I heard MacArthur say on radio, ‘‘I’m not so much interested in getting the elect saved as I am in keeping the non-elect from thinking they are saved.’’ That speaks volumes. Not that I can blame a Southern California pastor from wanting to keep worldliness out of the church, but I think in his desire to do so, he got the cart before the horse. Lordship Salvation is (among other things) a way to keep the undesirable out of the church. The alternative is, of course, to present salvation freely and wait to see if that faith was real. Real faith will change the life, false faith won’t. Of course, then we have to deal with sin in the church caused by false faith, an area we have not been so good at in the last few decades. Nevertheless, I think the church rightly responded to MacArthur’s Lordship approach to cleaning up the church. In his second book, I think MacArthur backed up, took a look at what was being said, and came at the subject from a slightly different angle. The second book is much more of a defense of the perseverance of the saints than of a pre-conversion screening of the lost. Though still raking Ryrie and Dallas Seminary, MacArthur is now dealing with more traditional terminology and concepts. If this had been the thrust of the first book, I’m not sure there would have been the present furor. But now the battle must be fought. And now I think MacArthur is making Dr. Ryrie say some things he never said. For example, in a discussion of antinomianism (of which MacArthur charges all non-lordship men) he quotes Ryrie as writing, ‘‘The unsaved person has only one course of action–to serve sin and self, or to leave God out of his life–while the believer has an option. He may serve God, and as long as he is in a human body he may also choose to leave God out and live according to the old nature.’’ Then MacArthur says, ‘‘Clearly, no-lordship (a loaded term) theology does make obedience optional. And that is what makes no-lordship theology antinomian’’ (p. 95). He simply takes Ryrie’s statement made in the subjunctive mode and changes the intention to an indicative. If Ryrie would say, ‘‘a Christian may commit adultery,’’ would it be fair if MacArthur interpreted that as if Ryrie were saying, ‘‘a Christian may go ahead and commit adultery?’’ No! But that is what he has done. Interestingly, when he deals with the Apostle Paul’s statement, ‘‘we should no longer be slaves to sin,’’ he asks, ‘‘Is Paul suggesting that it is optional as to whether we live as slaves to sin or not?’’ (p. 117) He should be so fair to Dr. Ryrie! Faith Works, however, is dealing more in the historical mainstream which is, since all Christians sin, how much sin can be allowed and for how long until we must deal with that professing believer as ‘‘an heathen man and a publican?’’ If someone who professes Christ never shows He is his Lord, we are not obligated to believe him. If someone who professes Christ stumbles occasionally, we are obligated to help him bear his burden. MacArthur is accusing the non-lordship view of teaching that a professing believer never has to show fruit of conversion (p. 106, 112 and others). I don’t get that from Ryries’ teachings and I don’t know many people who teach that at all. The Lordship of Christ, kept in the context of the perseverance of the saints, can be a profitable discussion. We all believe in it. How we deal with sin in the life of a professing believer is going to vary from church to church. We should not, however, be anxious to bifurcate the body of Christ over when we decide the profession is false. The Lordship of Christ, as a pre-conversion screening process, should be left on the shelf with the first book of this series.